Please take a moment to review some changes to our Terms and Data Policy. 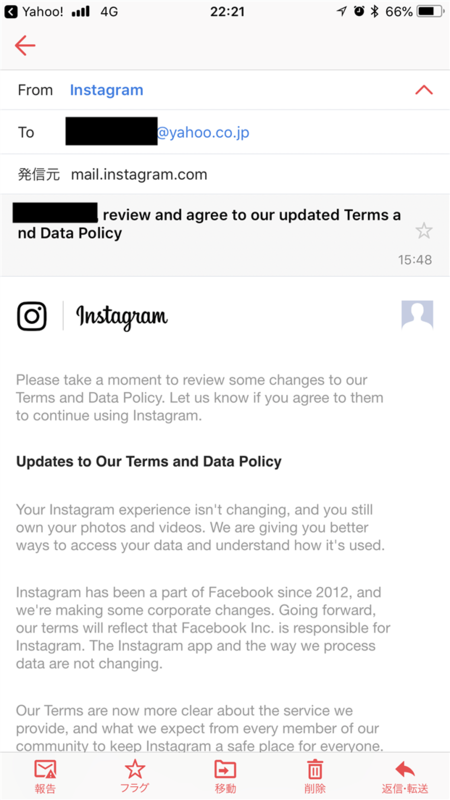 Let us know if you agree to them to continue using Instagram. Your Instagram experience isn't changing, and you still own your photos and videos. We are giving you better ways to access your data and understand how it's used. Instagram has been a part of Facebook since 2012, and we're making some corporate changes. Going forward, our terms will reflect that Facebook Inc. is responsible for Instagram. The Instagram app and the way we process data are not changing. We updated our intellectual property licenses, but your rights aren't changing. You still own your photos and videos. We updated how we use information to show activity on Instagram, so people can see when you've interacted with an ad the same way we do on a regular post. We also have a new Data Policy that explains how data is collected, shared and used in the Facebook Products, including Instagram. The policy addresses newer features like stories, direct messaging, activity status and the creative tools in our cameras. We wanted to make sure you knew about this new information in the policy. We receive different kinds of information from your device, like how you tap and scroll, which can help distinguish humans from bots and detect fraud. We can use and share information for research, especially in ways that help us keep our community safe on Instagram, like to understand and prevent bullying and harassment. The policy has more information about what we collect from your activity and our partners, how we connect information across the Facebook Companies and personalize your experience, including ads. We provide ads without telling advertisers who you are. The policy has more information about what we do share with advertisers and partners. We never sell your data. Because the policy also covers Facebook, it includes information about facial recognition. We don't use facial recognition technology on Instagram. If we introduce it, we'll let you know and give you a choice.